In a country that boasts Rome, historically a center of the world, as well as Venice, Florence and Milan, one can easily lose sight of the rest of Italy. Just as a European who visits only New York will see but one view of America, an American who explores no further than the big cities of Italy will only experience a part of Italy. When it comes to Italy tour guides, Perillo Tours works with only the best of the best. Federica literally grew up to be a Perillo tour guide! Her father Alberto started with us in the 1970s. Paolo has been a Perillo guide for over 20 years. He is one reason we have such a surprising number of repeat guests to Italy! A Perillo guide since 1980, Tony is animated, knowledgeable and passionate about his homeland. To know Tony is to have a friend for life! I have worked for Perillo since 1999. My father Nello since 1974! Come and visit Italy with us, we’ll show you the best and you’ll keep my country in your hearts forever. I’ve been working in tourism for many years and with Perillo for 15 years. I love meeting new people and share with them my enthusiasm for my country! I am always thrilled when greeting guests on arrival at the airport. I meet people that were with me on 3 other Perillo tours! 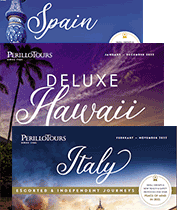 I have been working in the tourism business for over 30 years and most of them for Perillo Tours. I love my job, every minute of it! A tour guide for 30 years with the Perillo family, my greatest pleasure is to hear from our guests... “It has been a trip of a lifetime!” And I’m glad to be a part of it!